Maggie May was born January 21, 1999 to Camile and Spencer. Ken and Eva were the matchmakers that brought Maggie’s parents together. They were in Maggie’s life even before she was born, and at 3 days old, it was love at first sight and just after one little kiss, they knew, Maggie would be joining their family. She was named after Rod Stewarts’s song….Maggie May. At 8 weeks old, Maggie May went home with Ken and Eva, and then, their lives changed forever. Maggie was kennel trained for about 5 months, but when Ken was away for a few days, Maggie found a permanent spot on “her” new bed, previously known as “their” bed. Maggie was a smart girl, she passed puppy school with gold stars, and would do anything for a cookie, sit-stay…she would wait, and she was never a problem off leash. Potty training was a breeze for Maggie, along the way she chewed on a couple of place-mats and some CD’s, but it wasn’t too long before she had the run of the house, since she kept escaping from the kitchen anyhow to meet Ken and Eva at the door when coming home from work. She knew when is was breakfast time, no sleeping in for her, and dinner was always at 4. She loved to cuddle, but at times, she liked her space too, though she would always be within eye sight of those she loved the most. Maggie was adventurous, she loved her car rides, she loved to explore and loved to hike, but there was nothing better than playing in the mud, or chasing squirrels. She loved the beach, but not fond of swimming, up to the belly was plenty for her, chasing waves was a cooler thing to do. She loved to play ball and was amazing at catching Frisbees. Maggie was their slo-pitch team mascot, she loved the shaking hands ritual at the end of the game because then she knew, that she had the run of the ball field and everyone’s attention, she loved to show-off. Maggie loved the holidays, because she loved presents, especially fluffy squeakies, but the eyes, nose and ears had to go, so there were many lopsided animals about the house. Maggie, being a Jack Russell, got into trouble sometimes, such as putting her nose where it shouldn’t be, jumping too high for a Frisbee and losing a nail, being attacked by a lab and causing major injuries, a lump scare when she was young, she survived them all, she was tough, she was a fighter, but her biggest battle had yet to come….cancer. Ken and Eva gave her the chance to beat this too, she fought bravely through the treatment, but passed away peacefully on October 11, 2012. She went to heaven with her favourite blanket and her puppy, which was her first and favourite squeakie (no nose, no eyes, and one ear, just how she liked them). She lived a happy life, she was loved very much, she will never be forgotten and her spirit will live forever in the hearts of those that love her. Eva is originally from New Zealand, but came to Canada as a young girl. She now makes her home in Maple Ridge, BC. Her heritage is Hungarian and she is very proud to be a “Magyar”, a “Kiwi” and a “Canuck”. Eva currently works as an administrator/credit manager for a local wholesaler. Eva was very active in kayaking, running, cycling and slo-pitch. Her hobbies are photography, stamp collecting, gardening, and quilting. She loves the beach and her dream is to one day live by the ocean, with a bunch of furry kids. Eva has always been an animal lover. Her first pet at about 11 years of age, was a gerbil, named Gerbie, then two more named Fritzy and Suzie. Once on her own, she adopted a couple of kittens, named Cili and Timka, both lived to a grand old age of 20 years. Maggie May came into her life once she was married, and the three were inseperable. Together they explored BC, especially the Gulf Islands and hiked many trails in the lower mainland. Maggie May was a huge part of Eva’s life. Eva wants her memory to live forever and is dedicated to helping pets in need with their medical care in Maggie’s name. Although previously, Eva has had no interest in facebook, but now with “In Memory of Maggie May, she admits to being addicted and driving her followers crazy with her posts, but as she says “I have to share, it’s so cute, or it’s good information…”. 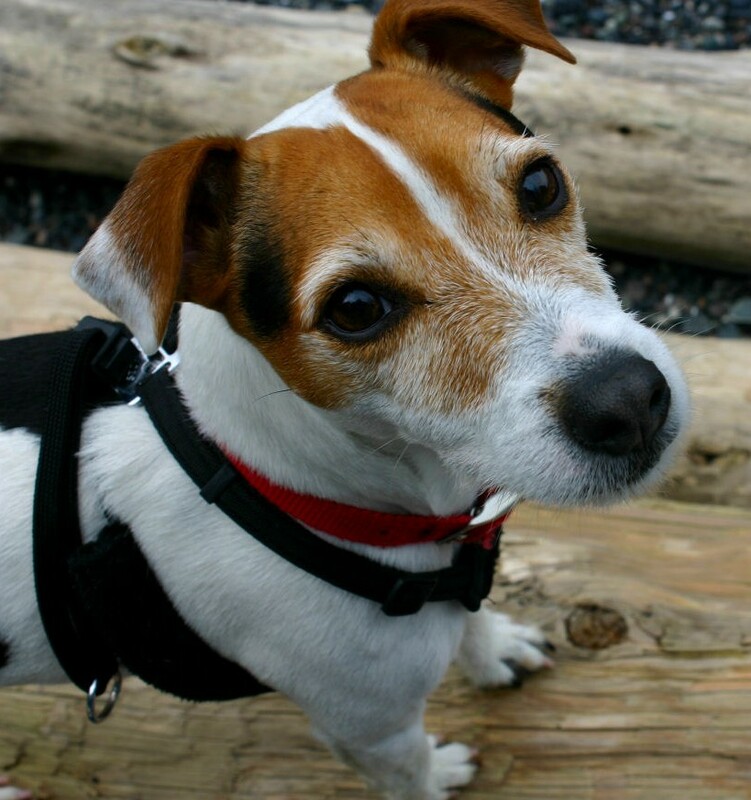 Eva and her husband opened their hearts again and adopted Jackie, also a Jack Russell, filling a void in their lives that they never thought could be filled. Together with Maggie’s spirit they are back exploring again. Jackie is a rescue, but even though she came from an abusive situation, she loves people and is the biggest cuddle bug you’ll ever meet. Jackie came into Ken and Eva’s life shortly after losing Maggie. Eva came across her story while surfing the net, she kept going back to Jackie’s photo, but then it was gone. She searched desperately for Jackie on other sites and finally found her story again which lead to the rescue organization. Jackie needed knee surgery, the reason she was taken off the adoptable list. Knee surgery or not, it was love at first sight, as with Maggie, and she knew Jackie’s home was with them. Ken & Eva adopted Jackie on February 8, 2013. In March, Jackie had her knee surgery, it would be quite a few months of recovery, it went quickly, and it was her weekly swim sessions that helped the most. Jackie took to the water like a duck, she is a strong swimmer, and it was very difficult to get her out of the pool….can you say temper tantrum! Jackie is a definite “tomboy”, put her in a dress and she looks like a boy in a dress. She is nosy to say the least, everything has to be checked out, food or not. Jackie has also taken over “their” bed, even though the blankets in her kennel are warmed with a hot water bottle every night to keep her comfy cozy. She sleeps in her kennel if she wants to, but they always find Jackie cuddled beside them when they wake in the morning. Jackie loves to sleep in, unlike Maggie who was up at 6:30 on the dot, no alarm needed. Breakfast for Jackie is whenever, but dinner had better be by 5pm. Jackie is smart as a whip, she has come a long way in just over a year, she has some things to work on still, but it will come. Jackie loves her car rides too, she loves her adventures, and is getting the chance to explore all the special places where Maggie went and more. She now swims down at the dykes or at the beach, and there is nothing she loves more. She does love her chuck-it ball (or any other dog’s ball) and her boomerang, and all the stuffies she inherited from Maggie. 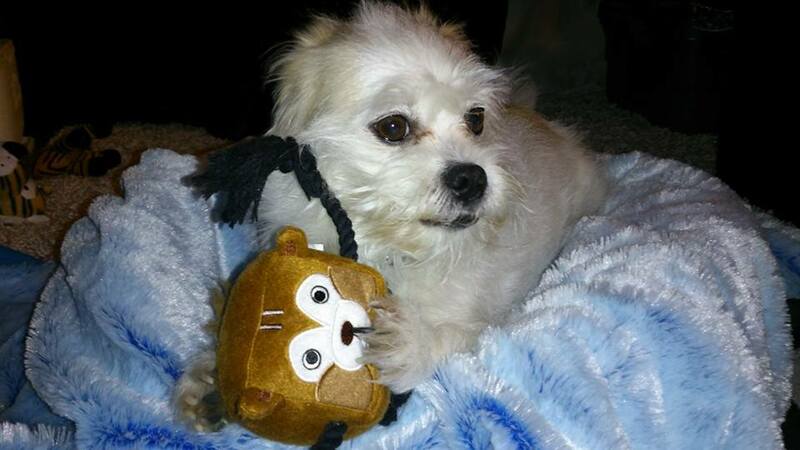 Jackie is learning how to play with other dogs, and her best teacher is “Louie” a Shih Tzu/Jack Russell Cross. They are the best of friends, Louie has taught her how to wrestle, and they even curl up together for a nap, it’s the sweetest sight. Louie has even joined Jackie as the Assistant Supervisor of Blanket and Bandana making. Jackie is happy and loved, she is a big part of their family and has a long and healthy life ahead of her. Jackie may have been rescued, but really, Jackie rescued Ken & Eva. Louie and Elizabeth have been a part of “In Memory of Maggie May” from the beginning and Louie is Jackie’s best friend. Louie who turned 8 this year is a Shih Tzu, Jack Russell Terrier cross, and is also affectionately called “baba”, “old man”, “monkey”, and “bug” by his mom Elizabeth, who adopted Louie on March 31, 2011. Elizabeth came across Louie on the internet and knew Louie’s home was with her. He was said to know his commands very well, be fully trained, house trained, leash trained, loved to play with other dogs, and of course sheds. This all is very true, but they failed to mention, that he also bears the famous JR stubborn streak, which only makes life with Louie even more enjoyable and entertaining. Louie was adopted from Prince George, which explains his love of ice puddles. His winter sport is rolling and sliding on ice, if there’s a puddle that has iced over, guaranteed he’s on it! 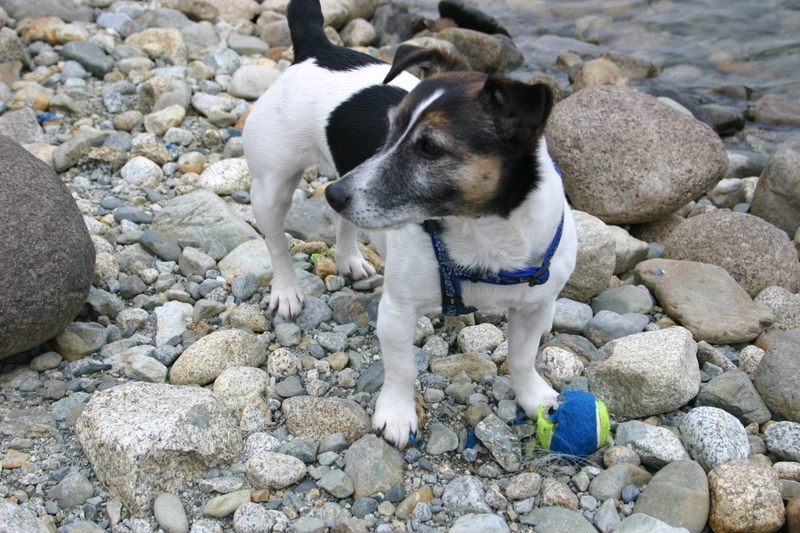 He also loves the beach, he will wade in the water, but only up to the belly, even though he can swim. Louie is fond of digging in the sand (presumably to China), and then resting in the big hole he has dug, surveying his surroundings, a very happy pup indeed. Louie has respect for cats, and one in particular named “Bella”. Bella is a friend of the family and has shown Louie who’s the boss. They have formed an amicable relationship, and Louie is always excited to go to “Bella’s House”. Bella will even allow Louie to sleep on her “Maggie May” blanket. Jackie and Louie hit it off immediately, they have both learned from each other. Louie has taught Jackie how to play and wrestle, while Jackie showed mellow Louie how to bark. Saturday’s are sewing days, which means playdate for these two best friends, they really don’t supervise. After a good day of play, Louie likes nothing better than tossing all the blankets from Jackie’s dog bed(s), and having a good long nap, and on occasion these two have been found curled up together. Louie and Elizabeth are a valuable addition to the “In Memory of Maggie May” team, it couldn’t be, without them. 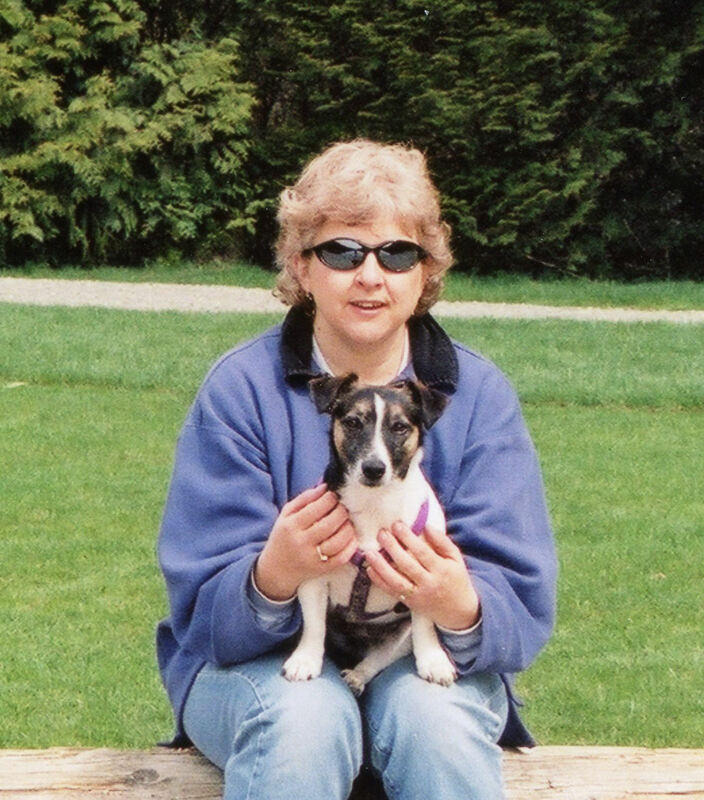 Salsa and Sharon joined “In Memory of Maggie May” in July 2014. Sharon is a huge supporter and when she offered her help, it was eagerly accepted. Salsa, the recipient of 5 “In Memory of Maggie May” blankets with a 6th in the works was hired as an Assistant Supervisor. 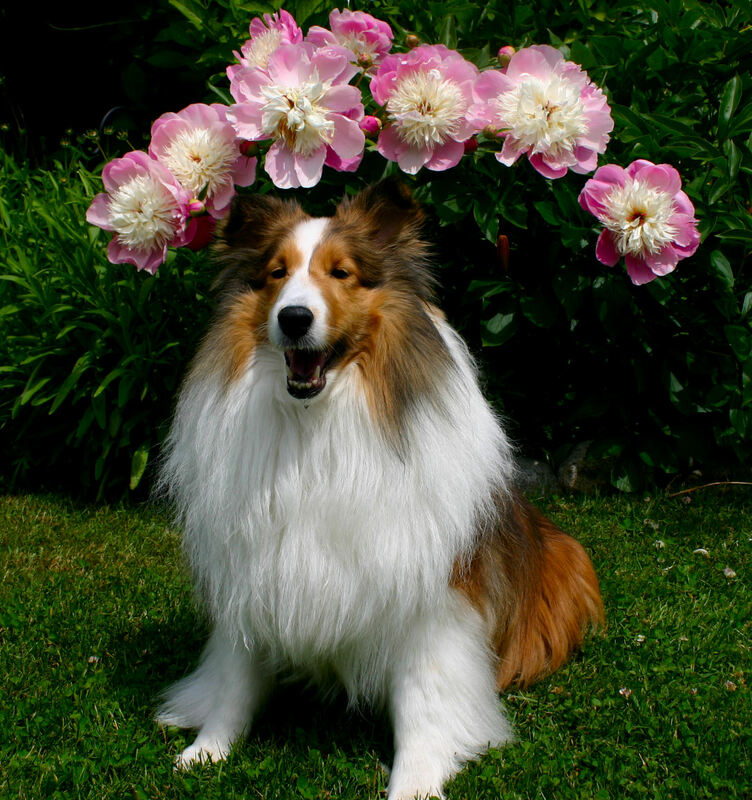 Salsa is a gorgeous 6 year old Sheltie, with a kind and sweet demeanor, and the most beautiful eyes in the world. Salsa came to Sharon as a pup, and has enriched her life just as “Vegas” had before her. Salsa loves her walks and relaxing in her cozy cottage in the gulf islands. The supervisors are now a trio, Louie and the girls!